Today im going to expain you how to setup multiple websites in a single Magento installation. I was getting crazy trying to solve this. Finally I found the solution. After create the X Websites you need from your Admin section we hace to edit a piece of code. Note: each Website has one unique Store and one unique Store View. Note2: use short and easy Websites codes, we will need them now. Using a Sub Directory means more job. First of all you need to create as much as directories you wanna have. So following the example you will create 2 directories in the root of your magento installation. Now you have to copy & paste the index.php and the .htaccess to those folders. Once that we need to edit the index.php. You need to repeat this step to every folder, to every index.php you created before. 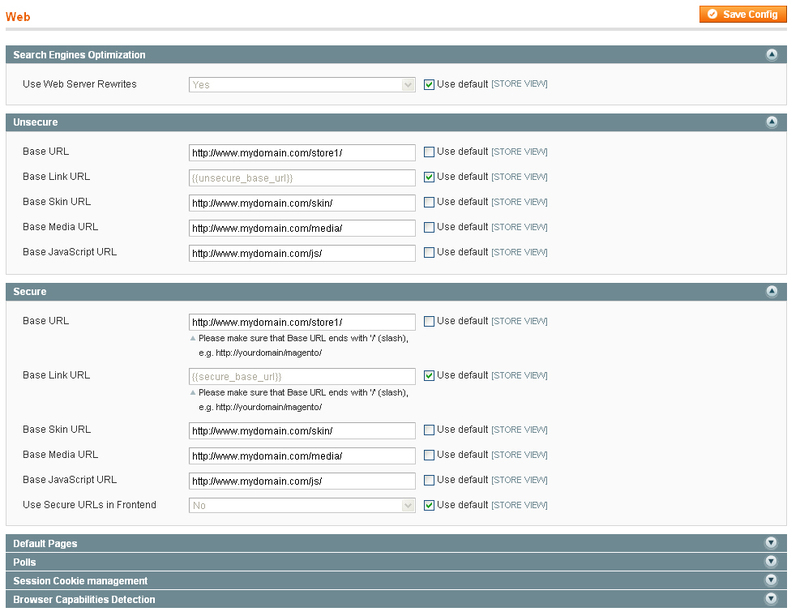 Now you know how to create multiples Websites in one Magento Installation. 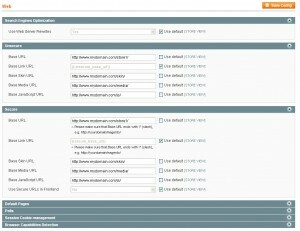 I am having trouble setting up 2 webstores in magento 1.4. I have magento installed at mydomain.com/magento. I wish for store1.mydomain.com to point to the default website on magento and for store2.mydomain.com to point to store2 which I have setup on magento admin. I have followed your instructions for subdomains but do not understand how the subdomains redirect to the correct stores? Sorry, I am completely new to php and Magento. Did you set the “Base URL” in your admin panel (under the Web tab)? It seems so simple in magento 1.4 rather than the older version. I have shop.mysite.com and store1.mysite.com. My magento installation is in shop.mysite.com. You have to follow the Sub Domain Method part of the post above. Is there a way to search in all the store when you create more then 1? I don’t think is posible to search products in diferent stores from 1 store. So.. Why having more than 1 store when you want to share product listing? Actually because we run a large print office and each category is also a subdomain so we got one main shop and all the categorys are shops too. Actually because we run a large pritn office and each category is also a subdomain so we got one main shop and all the categorys are shops too. i have magento installed on two sites. Can i have a common shopping cart for them using the multiple store method stated above? No, having multiple websites you can not buy from 2 websites in the same shopping cart. You have to buy the red shoes from the Shoes Store and the white car from the Car Store. If i setup multiple stores in my magento, then the shopping cart will be same for all the stores, right? I just tested in my local Magento now. Yes, both “stores” (not Websites) share the shopping cart. thanks for the tutorial but I still cannot figure it out … I have the main Magento installation in root and want to add second website in subfolder /wholesale. I copy index.php and .htaccess into the subfolder. Edit index.php and follow your tutorial … however, when I want to access the new store in /wholesale I am getting app/Mage.php error. If I change the path to ../app/Mage.php I will get the actual store with correct theme but every link goes to 404 … am I missing some crucial htaccess setting? Redirects? Are you using magento 1.4 version? I think this does not work in the 1.3 or older. About the .htaccess I didn’t modify anything. quicoto can you tell me if you got it working ? Any problems you find you can post in our Forums. i have a problem in my /wholesale is not appearing to have any theme. i tried a few things but still not appear anything! i want to use the same theme as the main site. Should i copy anything to the /wholesale subfolder? I guess “/wholestore” is the subfolder you created as a new Website, right? I think it’s something with the thing you changed before “../” and “/” relative paths. If you remove the “../” does it work? Did you changed all the things inside the .htaccess? Last time I did was everything fine. Don’t know how to help you, sorry. Can the problem be in the structure I’m using, since this is a subfolder in a subdomain? Perhaps subdmonain.com/store is not posible. I didn’t test that far. The 404 error, like you said, looks like .htaccess issue. Based on your example above, you’re creating multiple websites by using subdomains, but would one be able to set up multiple websites using different domains. Playing with Sub-Domains or Domains is exacly the same. You just need to point all your domains to the same directory (root folder). Thank you quicoto, I finally got it to work. I was having one of those fail moments where I forgot to change the Base URL to the store I was pointing to. I am having a hard time!! Have you created the stores in your backoffice properly ? Look at the “../” that means one directory up. I am redirected here in searching solution to multi domain, multi store setup. likewise setup for classi.local website. for the default store, the themes are loaded and working well. for the http://aki.local:8080 or http://classi.local:8080, the themes are not loaded. I only see the websites without themes. how do I tell magento to find the themes for aki.local and classi.local? Do I need create some folders for the new websites? yes more topics about this 🙂 I have the same issue as multiple people here. I have setup everything but somehow he still doesn’t see the correct js / css / media folders. Getting so crazy about this. Anybody who could help me? i have the same problem like sander, i did everything, looked on every tutorial i can lay my hands on, done exactly every step here, yet nothing, the /app/mage.php still haunts me !!! 4.789.786 post views so far. This page needed 49 queries to load.